Driven by inimitable natural forms, the performers interact like flocking birds, schools of fish and clouds in the wind. … the only thing that separates us is our skin. 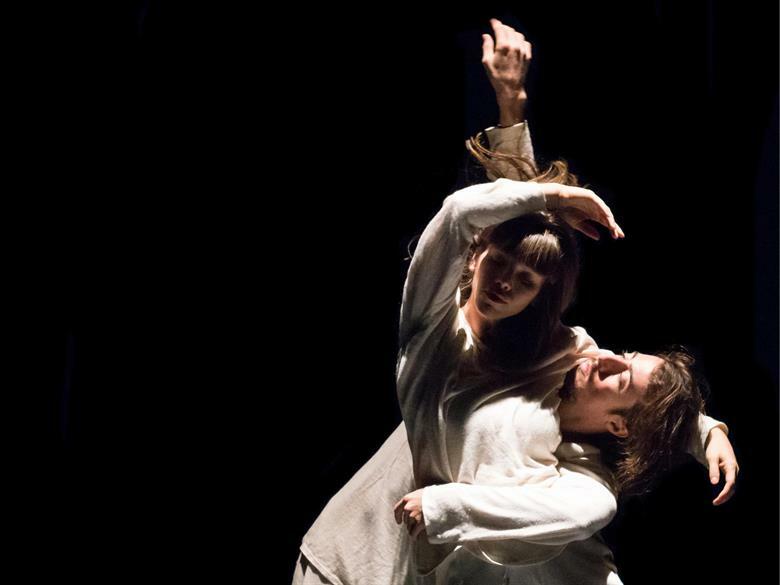 Synchronisation, mirroring, and empathy are core themes running through both of the new works in Dancenorth’s double bill In Two Minds. 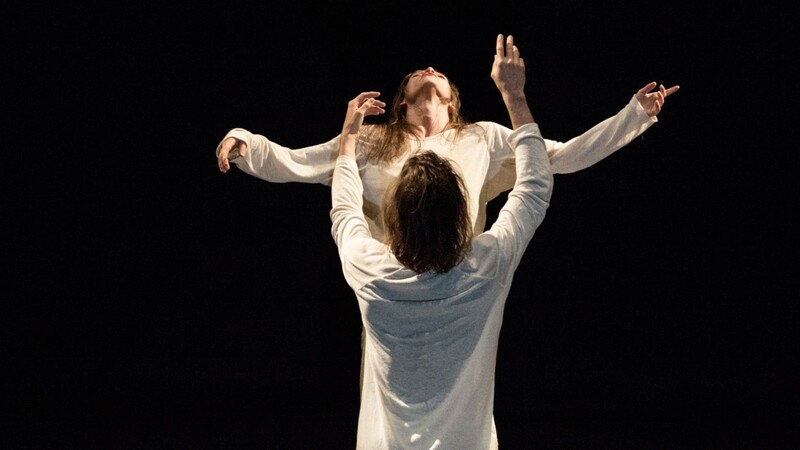 First is A Pre-emptive Requiem for Mother Nature, by Alisdair Macindoe in collaboration with the dancers (Harrison Hall, Mason Kelly, Jenni Large, and Ashley Mclellan). Melbourne-based Macindoe is a multi-talented artist: dancer, composer, choreographer and, for this work, projection designer and costume designer. To slow, dirge-like music by Henryk Górecki, the dancers appear in a tight group, moving close together in slow motion, with frequent pauses, which gives the viewer a feeling of suspension, almost like floating. The duration of movement between the pauses varies. When it is shorter, the effect is of watching time-lapse film. As the music swells and fades, the dancers move like a school of fish, in unison, with pauses and sudden changes of direction. They also sway, like kelp undulating in the sea. In later sequences, they appear like a flock of birds, making fleeting wing shapes with their arms, and joining their hands in a point like beaks. At the end, they are rolling and slow-motion tumbling on the floor – which I took to represent the motion of clouds mentioned in the program notes. The feeling projected by the dancers is of absorption and preoccupation with the creatures and environment whose essence is being expressed. The movement varies from slow motion, to very fast small jerky movements and jumps, counterpointing the slower waves of the music. It appears loose and relaxed, but is also very precise and controlled. 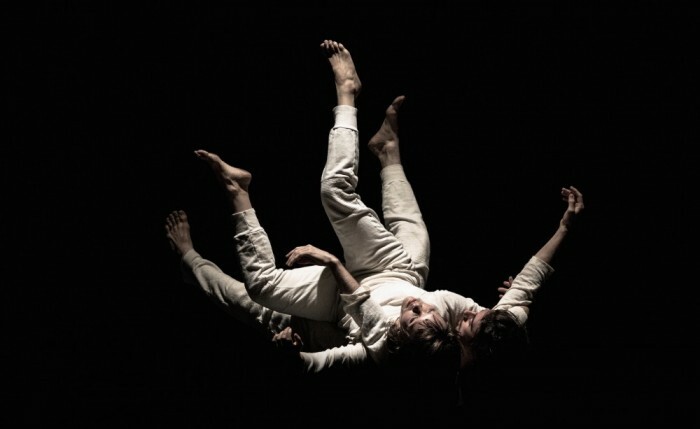 How do the dancers manage to match their movements so completely and move so precisely when they are so close together? This is the same question people ask about schools of fish and flocks of birds. The dancers wear simple, androgynous pants and tops in light, neutral colours. Film of the dancers is projected on a transparent screen in front of them, overlaid at different angles from the performers on stage. The projections later change to images like magnified particles drifting in water, and kaleidoscopic or fractal images like bees in a hive. The projections enrich the visual impact of the work, and magnify its effect: although there are only four dancers, the effect is of watching a much larger group. The cosmic scale of Górecki’s music sweeps over this work, amplifying its poignancy and beauty. 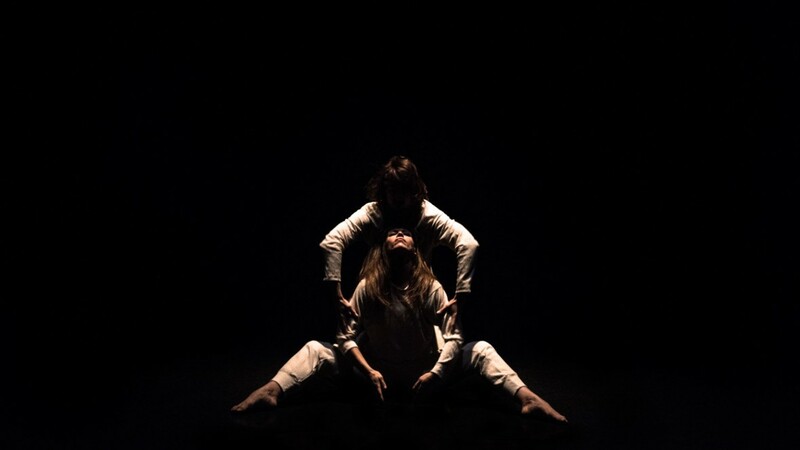 Syncing Feeling by Amber Haines (Rehearsal Director/Artistic Assistant) and Kyle Page (Artistic Director of the company) explores the many different possibilities in a duet. The dancers mirror each other, close together but without touching; Haines stands with one side of her body shuddering and twitching as if suffering electric shocks, and Page clasps her to stop it; they lie on the floor, with arms and legs waving like tentacles; they do many fast jumps and turns; they run; and there are some virtuosic lifts that fit in so completely with the rapid continuous flow that you almost wonder if they happened. In one amusing sequence, the only sound is their breath sucking in and the whoosh as their mouths attach like suckers to various parts of the other’s body. They also manipulate a large piece of dark fabric, disappearing underneath it to form monstrous shapes. 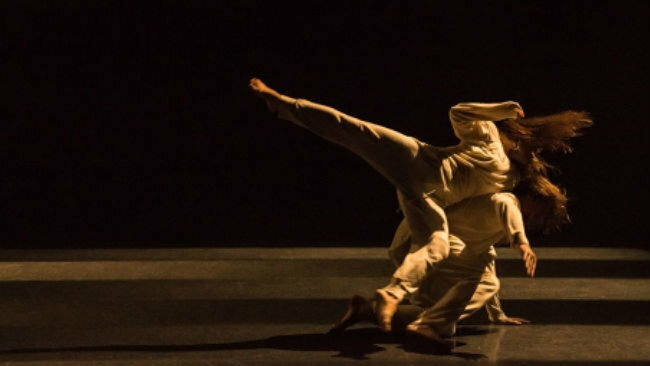 In solos, Haines runs, shudders, and moves as if swimming on the floor, while Page contorts his arms impossibly around his head and upper body. The movement is soft, boneless and very fluid. There is virtuosity, but this is not saying ‘look at me’ – it grows out of the other movement, like a wave building in the sea. Similarly organic and understated, the costumes are simple off-white pants and tops (designed by Fiona Todd-Logos) that don’t attract attention. The mood and movement correspond to a sound track by Alisdair Macindoe that ranges through many different dimensions: reverberating and dirge-like to start with; high-pitched whistling; sparking, buzzing noises, and thudding like heartbeats; bell chimes; and loud, grinding booms. In their program notes, Haines and Page refer to theories of mind, metacognition, and mirror neurons that drove the creation of Syncing Feeling and its aim to illuminate human cognitive processes, such as empathy, understanding others’ actions and feelings, and learning by imitation. Metacognition is an awareness of our own knowledge, the processes involved in learning, and how to control these processes. Mirror neurons are brain cells that are active both when we perform a physical act, and when we watch someone else perform that act. They have been used to explain why we identify with and experience other people’s actions when we watch them. For instance, when we watch dance, it is believed that we ‘experience’ the movement ourselves almost as if we were doing it. This feeling has been described as ‘kinesthetic empathy’, a term and concept developed well before the theory of mirror neurons. So in Syncing Feeling, we watch two dancers mirror each other and respond to each other, and we unconsciously mirror them. Dancenorth’s In Two Minds embodies a freshness and humanity, a purity of movement, and a depth of thought that are uplifting and inspiring. Lucky Townsville, to have Dancenorth based there. I hope the company can visit Brisbane more often.